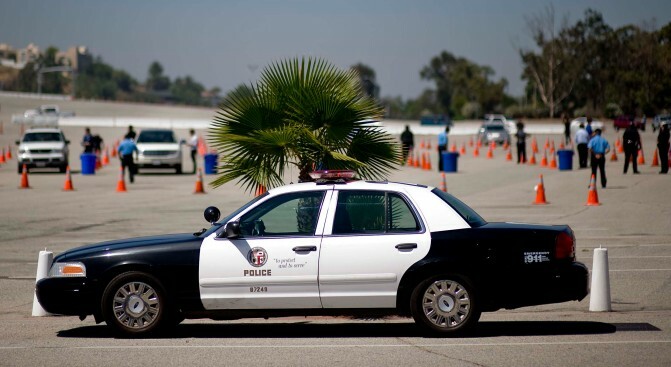 A patrol car belonging to the Los Angeles Police Department is parked near the Michael Jackson Memorial Service ticket pick-up area held at a parking lot at Dodger Stadium. Subway would have been a less expensive option, but the head of LA's Emergency Management Department said his people needed a lot of lunches in a hurry. Among the costs feeding controversy over city expenditures for Tuesday's Michael Jackson memorial is a lunch order for department personnel. The Emergency Management Department spent nearly $49,000 on 3,500 boxed lunches from Jensen's Finest Foods in Wrightwood, according to the LA Times. "It would have been preferable to make this purchase from a business located in the city of Los Angeles as opposed to nearly 80 miles away," City Controller Wendy Greuel said in a letter to James Featherstone, head of the Emergency Management Department. Featherstone said Jensen's has fed hungry city employees for years. He said the meals were more than just boxed lunches. Each order included "two sandwiches, two drinks, dessert, a candy bar, trail mix, chips or crackers, a granola bar and a pack of gum," according to the Times. Greuel told the Times that her office was given a estimate of $17,491 for 3,500 lunches from Subway. The total taxpayer expense of providing city services for the Michael Jackson memorial tribute at Staples Center was $1.4 million, according to a Twitter post by Matt Szabo, spokesman for Mayor Antonio Villaraigosa. Greuel expressed concerns about the cost even before the memorial began. In a letter to Mayor Antonio Villaraigosa, City Council President Eric Garcetti and Councilman Bernard Parks, chair of the Budget and Finance Committee -- dated the eve of the memorial -- she said, "we need to avoid spending any taxpayer funds without reimbursement." Greuel urged the officials to "move quickly to create a clear, coherent city policy that dictates who is financially responsible when an extraordinary event such as the Michael Jackson memorial takes place ... to protect our scarce resources during this budget crisis."